During Sephora's last VIB sale, I picked up Stila's Stay All Day Waterproof Liquid Eye Liner ($20US/$26CAD) in the hot new shade Turquoise. I really love Stila's Smudge Sticks, but this is the first time I've used one of their liquid liners. "This easy-glide, quick-dry precision liner stays in place until you say when—no smudges, feathering, or running. The thin, marker-like tip is easy to use, even for the beauty beginner, and delivers any look (from a thin line to a bold, dramatic stroke). It goes on smoothly without skipping, smudging, or pulling, and lasts all day!" I'm a huge liquid liner fan, and I actually generally prefer it to pencil liner. I find that liquid liners can offer a highly pigmented, bold line. Stila's Stay All Day Waterproof Liquid Eye Liner has a felt tip applicator, which is fairly new to me. I'm more familiar with a brush tip applicator, like that of MAKE UP FOR EVER's Aqua Liner. 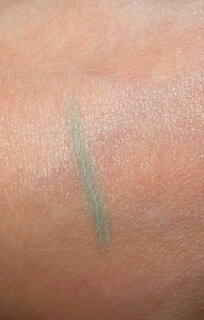 However, Stila's felt tip applicator is very easy to use, and I think anyone could use this liner without issues. This method of application feels very similar to using a pencil liner, which is one reason why it's so foolproof. I've been pairing Turquoise with a simple, natural eye look. 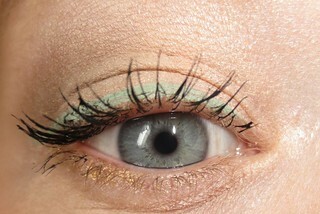 I like to use shadows from Urban Decay's Naked Basics Palette, and then add a pop of colour with Stila's Turquoise. The only problem with liquid liner is that you can't wear it on your bottom lash line, which is where I would love to add a pop of colour. Turquoise is a beautiful light green shade that is so popular this season. I love anything mint this time of year, so I was immediately drawn to this liner. Stila's really been rocking a lot of fun, bright shades lately! I do like this formula, but I wish that it was a bit more pigmented. I love the Turquoise shade, but it does apply a little muted. Stila's Smudge Sticks apply beautifully, so I had really high hopes for the waterproof formula. The lasting power of this liquid liner is good, but it doesn't make it to the end of the night. I notice my eye liner fading in the afternoon, and by dinnertime my liner is completely faded away. Sure, this liner is very easy to reapply, but I would rather my makeup last all day long. I have to admit, I was expecting more from this liner. I think the packaging is great, and if you're new to liquid liner, you might really love this one. However, I was hoping for a more pigmented and longer-lasting formula. Stila's Smudge Sticks are incredible, so I really wish I had picked that one up instead, but my Sephora was sold out. Do you have any tips or tricks on how to make Stila's Liquid Liners last all day long? Have you tried this formula before? How do you rock a colourful liner?